Do you remember your childhood imagination? Mine was a vibrant mix of superheroes, nightmares and the stories told by my grandmothers, both Italian immigrants. From their terrifying narratives of leaving behind a war-torn country to their folktales about wolves that would eat disobedient children, their stories were entertaining, imaginative—and scary. Personal Mythologies, a new exhibit on at the MAI gallery until Feb. 18, explores exactly that kind of personal, imaginative headspace. Featuring two Montreal-based artists, Osvaldo Ramirez Castillo, whose work is inspired by his family’s escape from El Salvador’s civil war in the 1980s, and Marigold Santos, whose work reflects her family’s emigration experience from the Philippines to Canada, Personal Mythologies is intellectually and emotionally engrossing. Hanging before the gallery’s windows like haunting dreamcatchers are several installation pieces by Santos featuring braided artificial hair, stapled paper and knotted cords, reflecting her fascination with ‘the woven.’ She says in her artist’s statement: “[The woven] becomes a form of talisman” with the “ability to invite, and repel.” Taking note of the whimsical and eerie elements included in Santos’ pieces—a braid, a jewelled necklace—viewers construct and weave their own stories, connecting the pieces. War, death, the afterlife and the lives left behind by war are all themes that Personal Mythologies invites readers to contemplate. In the centre of the room, Monument, an installation work by Castillo, incorporates earth, dolls, shoes, moss and plants to create an organic-looking space paying tribute to those left behind by war. Facing Castillo’s installation, Santos’ HEX (Secret Signals Hands), a series of large, finely-detailed illustrations of hands forming letters spell out: HOW DO WE TALK TO THE DEAD? 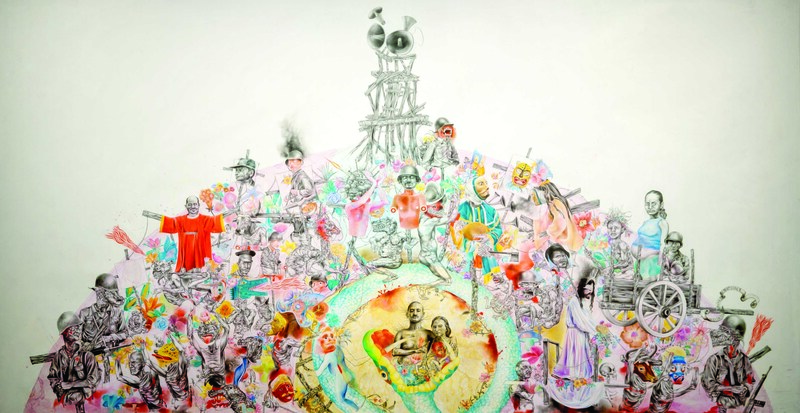 Across the room, Castillo’s illustration and painting piece My Tyrant, My Protest, My Myth showcases his finely-detailed drawing and ethereal execution of watercolour-like paints, depicting soldiers, priests, men with tattooed faces, muscled and contorted dogs, beasts and war imagery of all kinds. Bathed occasionally in red and always rendered with the same amazingly precise lines—Castillo cites Albrecht Durer as one of his influences—each individual face invites the viewer to look closer and appreciate all the subtlety those fine lines create. One of the great triumphs of Personal Mythologies is the mix of intriguing subject matter and spell-binding execution: both Castillo and Santos trained in print-making, and it’s a joy to walk through the exhibit admiring their skillful drawings. From Castillo’s postcard-sized portraits of Canadian soldiers, civilians and bizarre beings, to Santos’ series Secret Signals: 1, 2, and 3, featuring otherworldly-looking women in pastel and acid tones and incorporating string and braiding motifs, most of the artworks in Personal Mythologies are so detailed—and the lines so fine—that it’s almost impossible to believe that someone has drawn them so precisely. It’s clear that curator Zoë Chan has put together the ideal exhibit: works by Santos and Castillo seem to speak the same visual language, but the viewer is able to see each artist’s style and techniques as distinct and appreciate their uniqueness, creating an exhibit that is both harmonious and dynamic. I don’t usually write this personally about exhibits, but I left the MAI thinking about Personal Mythologies all day long. If you’ve got love or want to think up your own stories, Personal Mythologies is a must-see exhibition. Personal Mythologies is at the MAI gallery (3680 Jeanne-Mance St., suite 103) until Feb. 18. Admission is free. For more information, go to www.m-a-i.qc.ca.